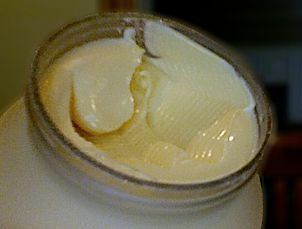 Mayonnaise is a Bingham plastic. The surface has ridges and peaks because Bingham plastics mimic solids under low shear stresses. It is used as a common mathematical model of mud flow in drilling engineering, and in the handling of slurries. A common example is toothpaste, which will not be extruded until a certain pressure is applied to the tube. It is then pushed out as a solid plug. Figure 1 shows a graph of the behaviour of an ordinary viscous (or Newtonian) fluid in red, for example in a pipe. If the pressure at one end of a pipe is increased this produces a stress on the fluid tending to make it move (called the shear stress) and the volumetric flow rate increases proportionally. However, for a Bingham Plastic fluid (in blue), stress can be applied but it will not flow until a certain value, the yield stress, is reached. Beyond this point the flow rate increases steadily with increasing shear stress. This is roughly the way in which Bingham presented his observation, in an experimental study of paints. 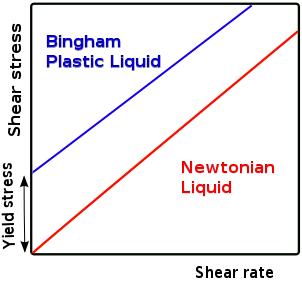 These properties allow a Bingham plastic to have a textured surface with peaks and ridges instead of a featureless surface like a Newtonian fluid. Figure 2 shows the way in which it is normally presented currently. The graph shows shear stress on the vertical axis and shear rate on the horizontal one. (Volumetric flow rate depends on the size of the pipe, shear rate is a measure of how the velocity changes with distance. It is proportional to flow rate, but does not depend on pipe size.) As before, the Newtonian fluid flows and gives a shear rate for any finite value of shear stress. However, the Bingham plastic again does not exhibit any shear rate (no flow and thus no velocity) until a certain stress is achieved. 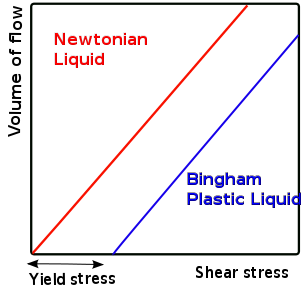 For the Newtonian fluid the slope of this line is the viscosity, which is the only parameter needed to describe its flow. By contrast, the Bingham plastic requires two parameters, the yield stress and the slope of the line, known as the plastic viscosity. The physical reason for this behaviour is that the liquid contains particles (such as clay) or large molecules (such as polymers) which have some kind of interaction, creating a weak solid structure, formerly known as a false body, and a certain amount of stress is required to break this structure. Once the structure has been broken, the particles move with the liquid under viscous forces. If the stress is removed, the particles associate again. Note: Darby and Melson's expression is for a Fanning friction factor, and needs to be multiplied by 4 to be used in the friction loss equations located elsewhere on this page. Although an exact analytical solution of the Buckingham–Reiner equation can be obtained because it is a fourth order polynomial equation in f, due to complexity of the solution it is rarely employed. Therefore, researchers have tried to develop explicit approximations for the Buckingham–Reiner equation. Both Swamee–Aggarwal equation and the Darby–Melson equation can be combined to give an explicit equation for determining the friction factor of Bingham plastic fluids in any regime. Relative roughness is not a parameter in any of the equations because the friction factor of Bingham plastic fluids is not sensitive to pipe roughness. ^ Bingham, E.C. (1916). "An Investigation of the Laws of Plastic Flow". US Bureau of Standards Bulletin. 13: 309–353. doi:10.6028/bulletin.304. ^ a b Steffe, J.F. (1996). Rheological Methods in Food Process Engineering (2nd ed.). ISBN 0-9632036-1-4. ^ Bingham, E.C. (1922). Fluidity and Plasticity. New York: McGraw-Hill. p. 219. ^ Darby, Ron (1996). "Chapter 6". Chemical Engineering Fluid Mechanics. Marcel Dekker. ISBN 0-8247-0444-4. ^ Buckingham, E. (1921). "On Plastic Flow Through Capillary Tubes". ASTM Proceedings. 21: 1154–1156. ^ a b Darby, R. and Melson J.(1981). "How to predict the friction factor for flow of Bingham plastics". Chemical Engineering 28: 59–61. ^ Darby, R.; et al. (September 1992). "Prediction friction loss in slurry pipes". Chemical Engineering. ^ Swamee, P.K. and Aggarwal, N.(2011). "Explicit equations for laminar flow of Bingham plastic fluids". Journal of Petroleum Science and Engineering. doi:10.1016/j.petrol.2011.01.015. ^ Danish, M. et al. (1981). "Approximate explicit analytical expressions of friction factor for flow of Bingham fluids in smooth pipes using Adomian decomposition method". Communications in Nonlinear Science and Numerical Simulation 16: 239–251. ^ Churchill, S.W. (November 7, 1977). "Friction factor equation spans all fluid-flow regimes". Chemical Engineering: 91–92. ^ Churchill, S.W. ; Usagi, R.A. (1972). "A general expression for the correlation of rates of transfer and other phenomena". AIChE Journal. 18 (6): 1121–1128. doi:10.1002/aic.690180606. This page was last edited on 14 November 2018, at 20:55 (UTC).